1 Edensaw is the happiest boy in Alaska! Today is the last day of school. Soon he will go to another kind of school. 2 Let me tell you about Edensaw. 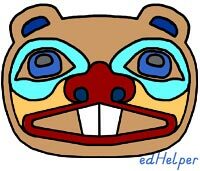 Edensaw is a seven-year-old Tlingit (clin-git) boy. He lives in a village near Icy Bay. His family is part of the Beaver Clan. Edensaw's name means "glacier." There are many glaciers near his home. 3 Edensaw is growing up like Tlingit children before him. He is expected to do whatever he can to help his family. He spends his time after school and during the summer picking berries, gathering roots and plants, and cleaning fish. Every year his work gets a little harder.